For picks to the best pizza of New York, get the Real Pizza of New York iPhone app – It’s your guide to the best, real pizza of NYC. Never again suffer another bad slice. The 2010 5-Boro Pizza Tour was great. See below for wrap-ups. Scott from Scott’s Pizza Tours and Adam from Slice for their support. and everyone who came on the tours. It was awesome. Sheepshead Bites – Pizzeria Del Corso, Papa Leone… What About Delmar? I’ve been all around this damn city looking for the best pies since Creation. And now it’s time to share. You may have seen lately that I’ve been doing exploratory tours through the boroughs looking for remarkable pies. I am continuing it as I type, and am now working towards a great tour for each borough. Last year was fun, but this year we are going deeper. Deeper into Queens, Deeper into Staten Island, Deeper into the Bronx, Deeper into Brooklyn and Deeper into Man-mother-effing-hattan. We will tour for 5 Sundays, a different borough on each day. We will sample a slice or 2 from each shop, ordering by the pie. 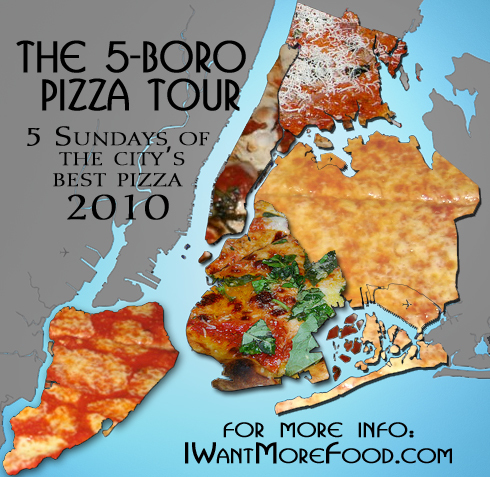 At the beginning of each tour, I will have a map of 5 remarkable pizzas of varying styles in the borough. Of those, only 1 will be from last year (The “winners” from last year). We will be transported by car. The drivers’ food is paid for by the passengers. We order regular, no topping pies by the pie as the measure for comparison. You can order more, but keep it safe. This is a marathon, not a race. Attendance is in groups of 8s. – I am having a bicycle tour parallel to the driving tour. Let me know if you are interested in this. If we have 6 people, the bicycle tour is a go. – I am not running any sort of grading system, but I don’t discourage you from doing so. I would love to have people write about their pizza tour experiences here. Why should I be the only one with a voice? If you want to write, you can use this blog as an outlet for your experiences with the tour. Name your winners, say what sucked and what should have been on the tour, whatever you want. You don’t have to make a work of art, you just have to tell your story. This is an ambitious tour, one not for the general public. But I am sure we can find enough freaks in this city of 10 million to satisfy a proper pizza eating group. This is not meant to be a feat of strength, we leave that to AYCE and IFOCE. This is a tour de pizza. Some of the places I haven’t been to yet, and I would be extremely surprised if anyone has eaten at all of the pizzerias city-wide, even all of the pizzas for just borough tour. Self-discovery questions will be answered. Do you prefer a dollops or a spread of cheese? Are you NYC or Naples style? Which types of ovens do you prefer? Brick, Coal, Metal? And does it matter? What does cost bring? Some pies may fall limp to your palate, and some will exceedingly surprise. I encourage attendees to bring their own comparison systems, if any, as it would be interesting to trade notes on grading. Myself, I don’t care to rank Bests. But that does not mean you shouldn’t. I think every place has their own merits and is special in their own way. Every pizzeria is somebody’s wife. That being said, this is an open-to-interpretation tour, there are no rules. – If you are interested, send me your name and location. I am aiming for groups in multiples of 8. Let me know if you would like to be a driver. Send me a message to be put on the list. I will send confirmations. – Drivers will pay nothing (other than drinks), and will abstain from drinking alcohol during the tour and cell phone talking while driving. – For the first tour, priority seating will go to those who went to last year’s pizza tour. From then on, priority will go to those who’ve been on this year’s previous tours. – We meet at the first pizzeria or driving arrangements will be made accessible if there are multiple people coming from the same area. Oh nos! I’ll be out of town when this happens and I’ve been dying to try di faras ;_; I’ll try to join the next one! If you need recommendations for pizzerias in Staten Island, I can help you out! I have 2 within blocks of my house. One is Goodfellas on Hylan Boulevard. They have a wood fire oven with pizzas that are unbelievable. And not just your standard pizzas either. Go for the 4 seasons pir or the Pizza alla Vodka. A few blocks south is Salvatore of Soho that features a coal fire oven. This is becoming one of Staten Island’s best. Within the same area in SI, right off the Dongan Hills train station is Lee’s Tavern that has one of the best clam pies going. And then there’s the one that the most popular and that Denino’s in the Port Richmond area of Staten Island. If you have any questions, ask the native Islander and I’ll gladly help. Are you accepting people for the 2010 tour yet? I would love to attend – I would be up for any of them, but if you want me to choose, I’ll go with Brooklyn. Hey! This looks really cool. I’d love to join if you have space! ah yes, if you need a filler, im in. What time will the 5/2 pizza tour begin? Ohh, I would love to tag along this year. I generally eat pizza 4-5 times a week but do not have a car, so my exploration has been dependent on walking and subway riding. Hope there’s room! I’m definitely in for the May 2 Queens tour — it’s actually the day after I move to Queens (from the Bx). I second Anita’s recommendations for Staten. Salvatore’s of Soho and Goodfellas, two birds with one stone (since they are so close together). I would definitely be interested in the bicycle pizza tour next weekend or after. Please let me know if you have space for 2 people. Any spots left for tomorrows tour?who do I contact? Any more Pizza crawls planned for the future? Hey, and how ’bout an Android pizza app for us non-iphone pizza people! Stay tuned for Annie’s Jersey Pizza Tours this winter. Do you want me to put you on the pizza tour mailing list? Absolutely, yes! And I must admit, I’ve never ever thought of going to Jersey for pizza!